Reassemble are back once again with our annual April event celebrating Sarge's Birthday!! Our tickets are electronic, we do not send out paper tickets so please save your order number or bring you ID & bank card on the night to claim entry as your name will be on the guest list! Please be aware, Factory only accepts either driving licenses or passports as valid forms of ID. It does not accept UK Citizen Cards due to the sheer amount of fakes currently in circulation. The venue operates a strict Challenge 25 policy so please bring correct identification or risk not getting into the event. 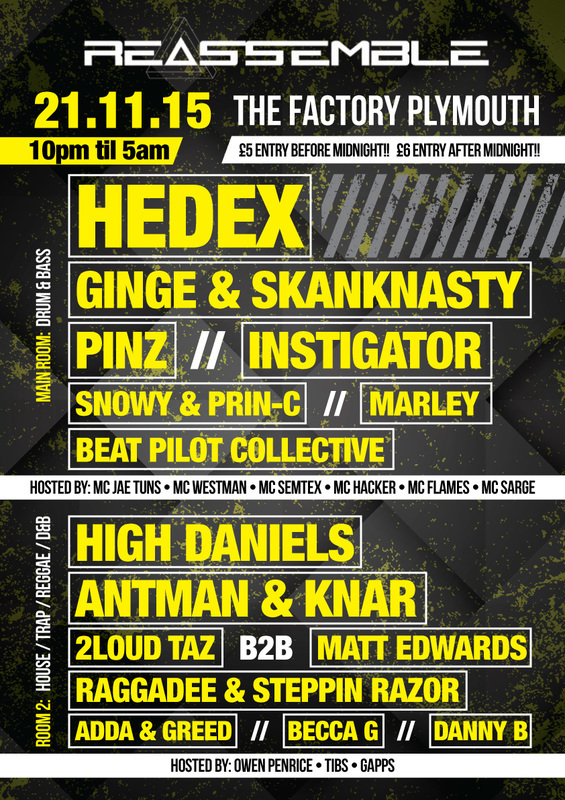 Factory operates a zero tolerance drug policy - anyone found in possession of drugs will be immediately ejected from the venue and banned with your details being passed over to Devon & Cornwall Police. Our door staff search every customer upon entry and have the right to perform random drug searches throughout the night, failure to comply will mean either no entrance or being immediately ejected from the venue. The Return Of Reassemble Radio!! After a 1 year break Reassemble Radio is back on the airwaves with a Solid Radio Server & Facebook Live streams. We are currently looking to sign up new shows to add to our live calendar so please email us at Reassemble.management@gmail.com with a demo mix named "Reassemble Radio Demo" & upload to Soundcloud. We aim to build a thriving community of artists ranging from genres Drum & Bass, Jungle, UKG & Bassline! ALONG SIDE THE BEST THE SOUTH WEST HAS TO OFFER!! LEVELA B2B JAYLINE B2B FREEK & MC KUEDON!! 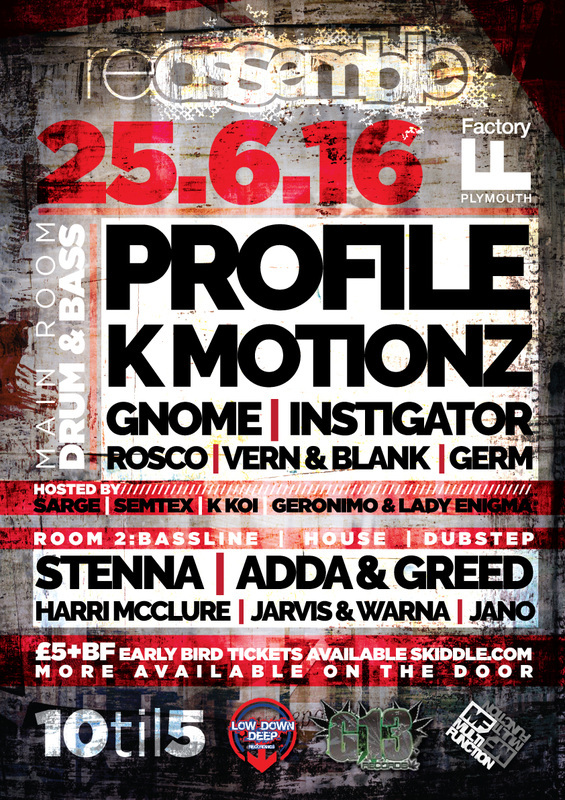 REASSEMBLE *PROFILE & K MOTIONZ* AT THE FACTORY, SAT JUNE 25TH!! 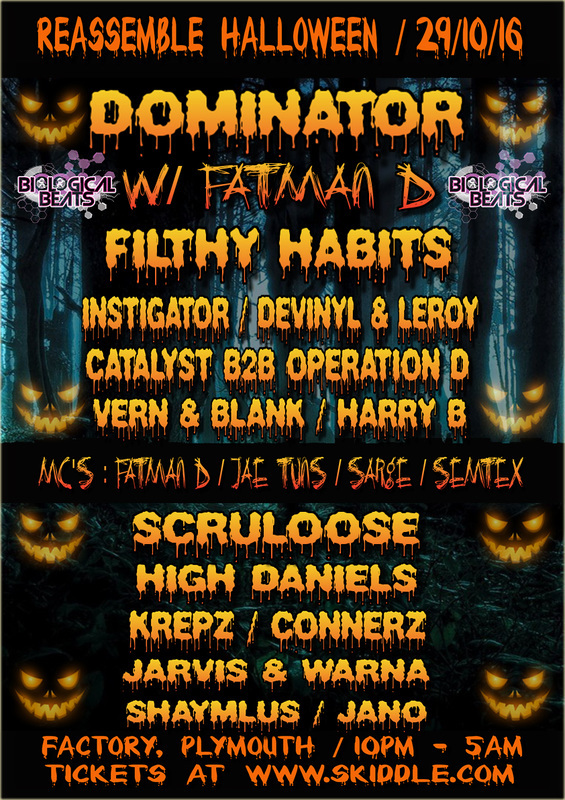 SWITCHING THINGS UP AT THIS ONE WITH BASSLINE/GARAGE/HOUSE/GRIME IN THE MAIN ROOM WITH 2 TASTY HEADLINERS & OF COURSE OUR DRUM & BASS RESIDENTS IN ROOM 2!! £5 ENTRY B4 12AM! M.O.T.D!! HELP RAM RECORDS FIND GNOME!! HELP RAM RECORDS FIND GNOME & VOTE HERE FOR HIS TRACK "EVERYBODYS LOOKING FOR SOMEONE"